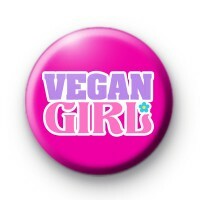 Bright pink slogan badge with the wording Vegan Girl written in a bold Pink and Purple font. It is a cute, positive Vegan badge and one that would look fun pinned to your coat/bag. Veganism is becoming more popular and people are more aware of its health and environmental benefits. Not to mention protecting the animals. We now have a Vegan badge category with lots more fun, cute and positive Vegan badges so be sure to check it out. All our badges are 25mm in size and handmade by us in Cornwall.